In this article, PulseLearning explores 5 vast microlearning benefits and why you can’t afford to ignore them. Microlearning is the hot new eLearning trend that is revolutionizing traditional eLearning. The mobile technology boom has led to an increase in mobile device ownership, and market research shows that people are accessing digital content more often on smartphones and tablets than desktop computers. This means the design and delivery of online learning must use innovative approaches for compatibility with the mobile shift. So, how microlearning benefits online training? Let us first see what exactly microlearning is. Microlearning is a modular delivery approach to online training where content is engineered into a series of short, concise, and dynamic learning moments, each a complete experience on its own while supporting the learning sequence as a whole. A microlearning module could consist of a single asset such as a video or infographic rather than a series of text and image slides. Here are 5 important microlearning benefits you cannot ignore. Millennials (those born between 1980 and 2000) are now established in the workforce, forming the majority generation of the working population. Millennials grew up with computing technology and are accustomed to easily and quickly accessing information using the internet. To engage this audience, clever use of technology should be incorporated into the educational experience and microlearning does this while providing on-demand access through mobile devices. Microlearning allows content to be delivered in short “bursts”, aligning to natural attention span to enhance knowledge retention. Because knowledge transfer is more efficient in a microlearning model, the overall duration of training can often be reduced, leading to an increase in ROI on training budgets. Long, costly eLearning training has lost favor to short, concise microlearning assets; for example, an online manual could be re-engineered into a series of short demonstration videos. Because of its modular structure, it is easy to edit or update a microlearning module without taking an entire course offline. Microlearning is perfectly suited for delivery on mobile-devices: Mobile learning offers ultimate convenience and flexibility to learners. Employees won’t have to scramble to fit training in during work hours or stay behind to complete it; instead, modules can be worked through in pockets of downtime such as during the commute home or over a lunchtime coffee break. 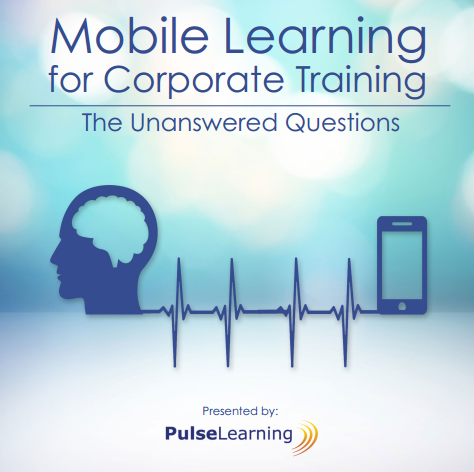 Having the option to complete training on personal mobile devices can increase willingness to engage with the learning experience. With microlearning, you can set training up so learners can access it as they require and learning materials can be used for on-the-job support. Allowing learners to self-manage their training by “pulling” information as they need it, rather than “pushing” toward them what you think they require, can build empowerment and shift attitudes toward training. The modular asset components of a microlearning solution can be mixed and matched to create new courses. For example, core assets might be included for all groups, with the addition of unique assets or modules for specific role groups. Microlearning assets could also be used to set up an on-demand suite of training that can be accessed anywhere, anytime learners require them. Are you ready to move toward microlearning? PulseLearning can assist in creating learner-centered solutions, current with today’s technological trends, to engage and delight your learners. PulseLearning is an award-winning global learning provider experienced in developing engaging and innovative eLearning and blended learning solutions.